Candidate can appear for SUAT either at Sharda University campus or Regional Offices or at SUAT Exam Centres. 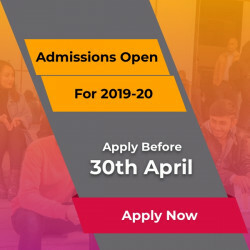 SUAT Online Exam dates are 13th, 14th & 15th May 2019. Sharda University has almost 180 global tie-ups which are beneficial for students and faculty. Not less than a town! Sharda University has each and every facility within the campus so there is no need of visiting outside the campus, you can enjoy within the campus with lots of facilities. We have students from over 80+ countries other than India and has thus become a melting pot of diverse cultures, backgrounds, and ethnicities. It is the largest educational group based in Uttar Pradesh, having 20,000+ students from different cultures and nationalities. Sharda University offers around 1200 faculty with highly qualified and these faculty members ensure the students to achieve their goals. These faculty are also provided with proper training. The university offers courses at the undergraduate and postgraduate level. In each and every course they provide well educated faculty. Diwakar Vaish (B.Tech - CSE) is one of those students who found his future and set pioneering milestones. With his determined efforts and focused mind, he developed India's First Indigenously built 3D Printed Humanoid Robot - Manav. Unstoppable in his momentum, he also launched World's Smallest Ventilator and the Worldâ€™s First Brain-controlled wheelchair. He made his faculty proud and also became a source of inspiration for others entering the realm of tech. Mr. Simarpreet Singh Chandhok (B.Tech CSE) added one more feather to the glory cap of Sharda University by writing a novel Adolescence A Lost Glance. His nuggets of wisdom proved their excellence as the novel acclaimed as hit among the avid readers. Going beyond boundaries, Sourav Khatua (B.Tech - Civil Engg.) is now living the dream of his life. His promptness and agility have brought him the great opportunity that many students only wish to get. He is now pursuing MS (Structural Engg.) from the well-known University of Akron, Ohio. Students like Sourav are an inspiring model to those who wish to achieve something in life. With over 15 citations and 3 researches, Nilisha Pokhrel (B.Tech - BioTech) is ambitiously writing her success story. After scoring high in the GRE and TOEFL exams, Ms. Pokhrelis now pursuing Ph.D. at the prestigious Marquette University, USA, exploring the world beyond boundaries. Sharda University is proud to have gems like Nilisha Pokhrel as its guiding star for the young minds. Gursatya Guru Singh (B.Tech - BioTech) is constantly marking his territory in the world through his undying passion for science. He recently joined Science Exchange, the world's leading platform for outsourced research and development (R&D). He will be leading the companyâ€™s management team as Director of Scientific Content. His achievements at this young age are a paradigm of how Sharda University is a land of future leaders. My life at Sharda university made me stronger and took me a step ahead for being an independent women. I am thankful to all the teachers who supported us and corrected us throughout our bachelors. I loved the infrastructure of Sharda University and its International life. The events that I took part helped me to grow my confidence level. I would like to specially thank the placement cell for guiding me and providing me a good platform (company) for my career. Due to the efforts made by the faculty and placement cell at Sharda University i was able to bag a job in the second company that i applied for. They always provided me with the assistance that i required for my overall development and to improve my technical knowledge. I will always be grateful to them for providing me a platform of practical learning and preparing me for the corporate life. I would like to thank my University and faculty members for providing me a platform to prove myself, proud to be Shardan”. I can positively say Sharda University has made me a better person and moreover a professional. The facilities, environment and the resources here are much better than many other educational institute in NCR. It has been a life experience of being a part of such a multicultural place. Sharda University as a family gave birth to my organisational skills , nurtured them in the span of 5 long years and here I am implementing those in the real corporate world” Thank you Sharda University. Life at college is the time when the teenage years end and we all dive deep into the ocean of new beginnings and possibilities and prepare everyone to face any problems in life. Sharda University gave me all the requirement in behaviour,academics and improvement in skills as well. The teachers are very cooperative and motivate us to be a good human being. College life in Sharda University is a great experience as Sharda University is one of the best Universities in our country and I am glad to be a part of this University. Check out the One-stop-shop for all the Campus related needs. Search for 'Sharda University' in Google Play and App Store to DOWNLOAD THE APP.